The St. Patrick Parish Pastoral Council was restructured under the leadership of the current pastor, Father Henry Kulah, who was assigned to St. Patrick in 2008. The new organizational format consists of a steering committee of 8 members appointed by the pastor. The first organizational meeting of the Committee was held on May 15, 2014. The term of the Pastoral Council Steering Committee member is 3 years with the possibility of re-appointment by the Pastor. Members may serve only 2 consecutive terms (6 years). Only the Pastor may call a meeting of the PC Steering Committee. There should be a minimum of 6 regular meetings a year. The 6 standard PC Committees and their subcommittees should meet monthly, or as needed. All meetings are generally open to parishioners. Dates and times are posted in the parish Bulletin. coordinate all parish activities in a manner that will best serve the interests of the parish. Good communication between the PC Steering Committee and the Pastoral Finance Council is essential. A member of the PC Finance Council serves on the PC Steering Committee. Assist the parish and the pastoral council to include evangelization as a dimension of every parish activity and ministry which include Christian formation, liturgical, prayer, worship, religious education on all levels, and ministry fairs to promote volunteerism. Strive to enable young people to be full and active participants in the life of the Church by developing and maintaining a youth ministry network; provide quality programs and activities for youths in the parish. Assist parish in becoming a community of service by developing and maintaining active social concerns programs which reflect gospel values of service, justice, mercy and peace. Oversee the Parish Website, improve advertisement in local publications, seek opportunities for public service announcements, maintain parish calendar, review and give input on the Parish Bulletin. Create social media presence such as Facebook and improve internal communication. “Develop a Sustainable Parish through Stewardship"
Provide continuity and good communication with the Parish Finance Council; identify, analyze, and recommend strategies to encourage parishioner participation in, and financial support of, the parish and its pastoral ministries and programs; find ways to provide funding for parish sponsored projects and community activities; support long-range planning for the financial needs of the parish, on-line giving, offering time, talent and sacrificial giving. Ensure that the parish plant and its campus are maintained in a functionally efficient, clean, attractive, safe, and operational manner. In addition, the Committee advises and develops short and long range strategies for the upkeep and development of the parish campus. Parish properties include the church, St. Patrick Parish Center; Mr. Oliver’s House the Pastor’s Rectory; a storage garage and a grave yard located on the church property. "St. Patrick is a Welcoming, Family Church"
"St. Patrick Catholic Church is a faith-filled community forever growing in a relationship with Christ. We celebrate the presence of Christ in Word and Sacrament, demonstrate love and concern for all parishioners, teach by example and serve the needs of others in our community." Re-affirmation of Marriage Vows. Thirty couples, married for 10 or more years, participated in the ceremony held September 25, 2016. 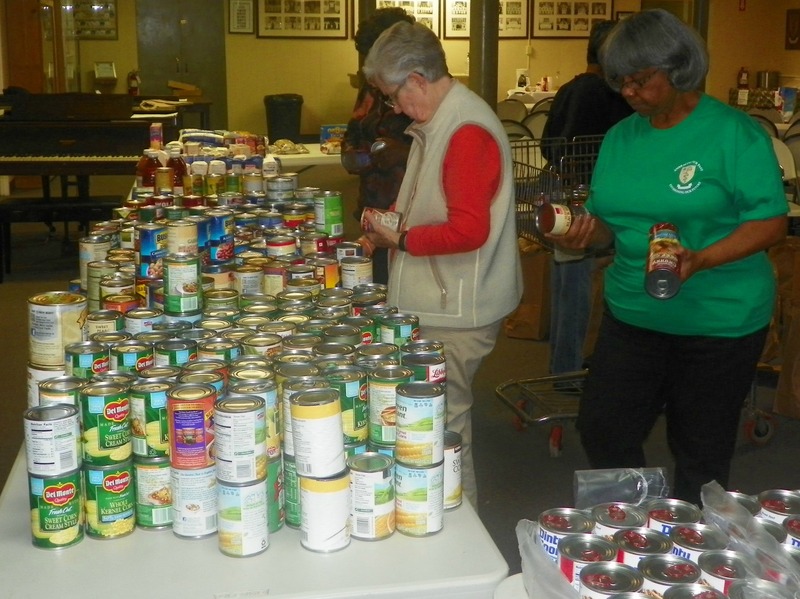 Sorting items for the holiday food baskets donated annually to needy families in the community. 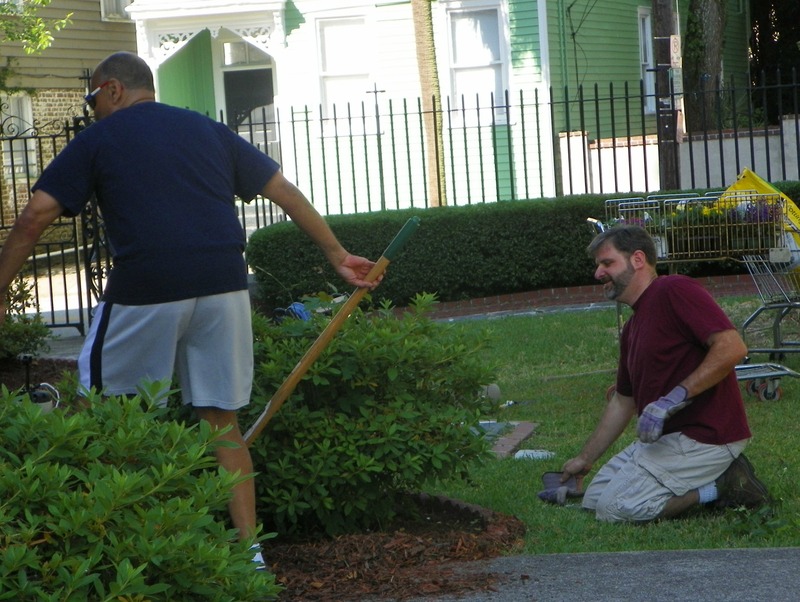 Yard clean-up volunteers hard at work!